From left are Makenzie Strahm, Taylor Stephen and Alexis McCoy who received gold ratings at Ohio Region 3 evaluations. Mount Gilead FFA Advisor Matt Gompf and Mount Gilead High School Principal, Deb Clauss congratulated chapter members and chapter officers for their success at the Region 3 Ohio FFA Evaluations Monday. They now wait for state judging on Feb. 22-23. 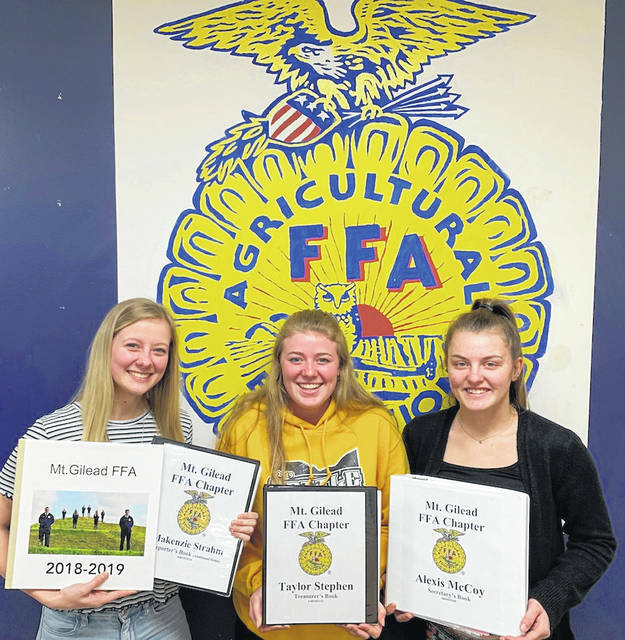 The Mount Gilead FFA Chapter Invites the community to join them for their annual pancake breakfast held in a new location this year at Gilead Christian School Elementary on Feb. 23, starting at 7 a.m. It will be a great way to say congratulations to these individuals. Taylor Stephen – Agricultural Service Entrepreneurship Proficiency -Advanced	Holly Gompf -Diversified Crop Entrepreneurship Proficiency -Advanced.-Diversified Crop Entrepreneurship Proficiency -Advanced -Diversified Agricultural Entrepreneurship Proficiency -Advanced.